WordPerfect Office X5 is an alternative to the industry standard Microsoft Office Suite, though it is a serious contender and the name WordPerfect has been known perhaps a lot longer than Office has. The Word Perfect Download contains essential office programs such as the original word processor, spreadsheets, presentations and an email client. Though it is a competitor to Microsoft Office, it does contain compatibility support with "SharePoint". 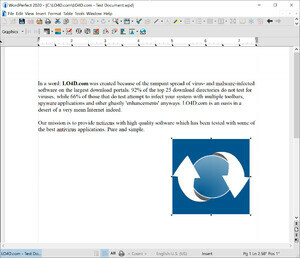 The Word Perfect suite by Corel also includes PDF tools, allowing you to create, markup and essentially share PDF files directly from within the program. WordPerfect Office X8 is a shareware program and can be used as a demo to try the software until the free trial period has ended. A full version of the program is available after the trial period ends. For security reasons, you should also check out the WordPerfect Office download at LO4D.com which includes virus and malware tests. Additional screenshots of this application download may be available, too. 3.57 out of 5 based on 7 ratings. WordPerfect Office has a presence on social networks.